Do you do a good bit of your work from home? If so, you have probably been thinking about having a home office. Sometimes, just setting up at the kitchen table just doesn’t cut it. You have too many distractions. You need a place where you can get work done. 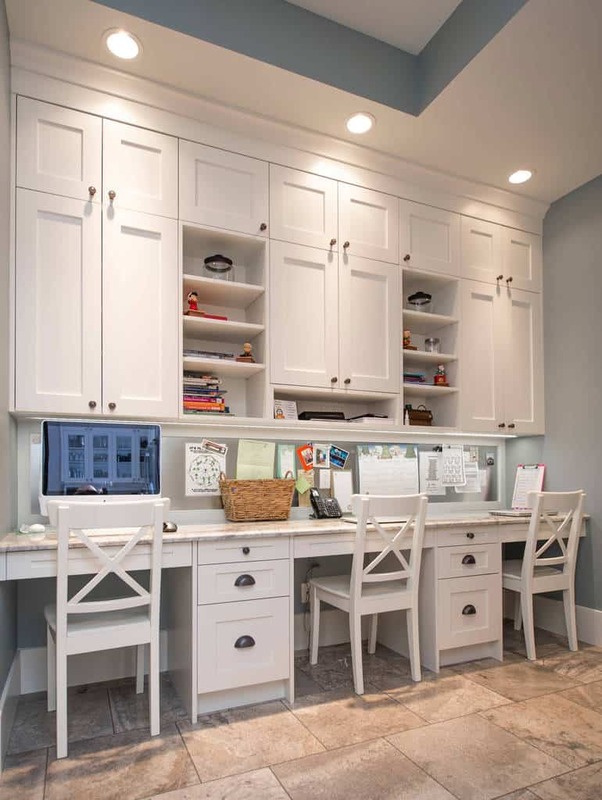 What kind of home office you do want to design? We know that there are so many options for home offices, but you want something that matches you and your personality. After all, you will be spending a lot of time in there, so make it comfortable for yourself. 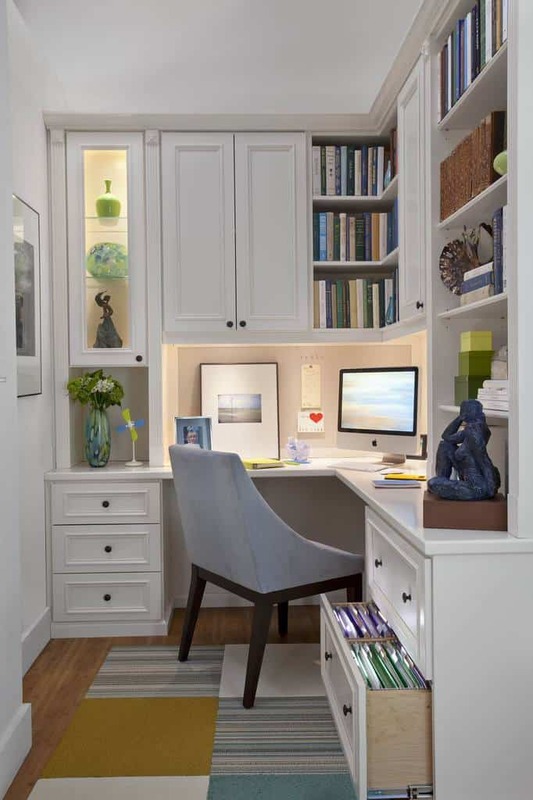 We have gathered 45 home office design ideas that you can look through. Take some styles that work and run with them. 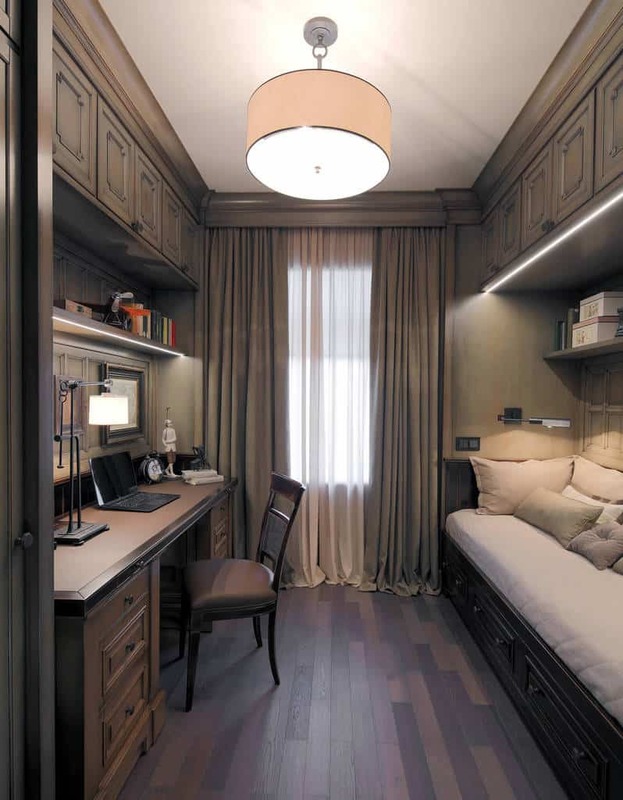 This home office is meant to create a working space as well as an area that you can comfortably entertain guests. Make your home office match your personality. This one is bright and has great colorful decor. 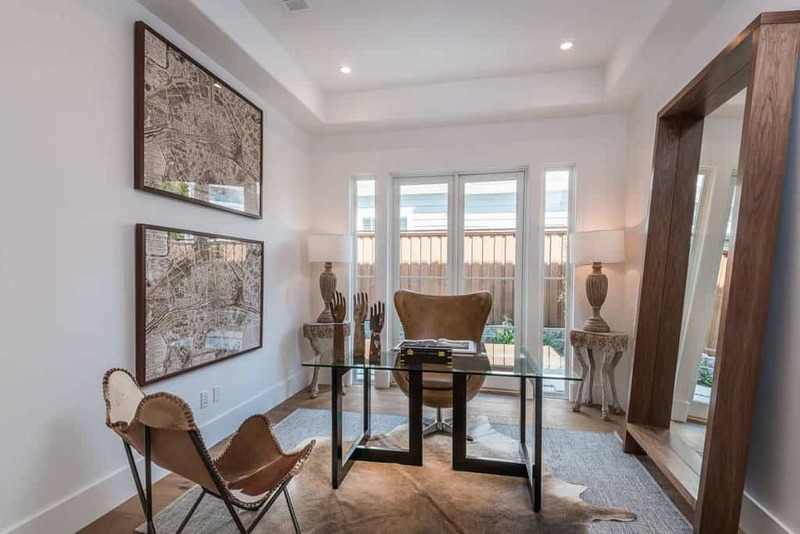 This home office has great abstract artwork and simple furniture. Functional and stylish, you can get work done here. When you need a break from the hard work, you can go lay down on the bench and take in the natural light. With the hardwood floor as a great base in this home office, the color choices make this space fun and inviting. 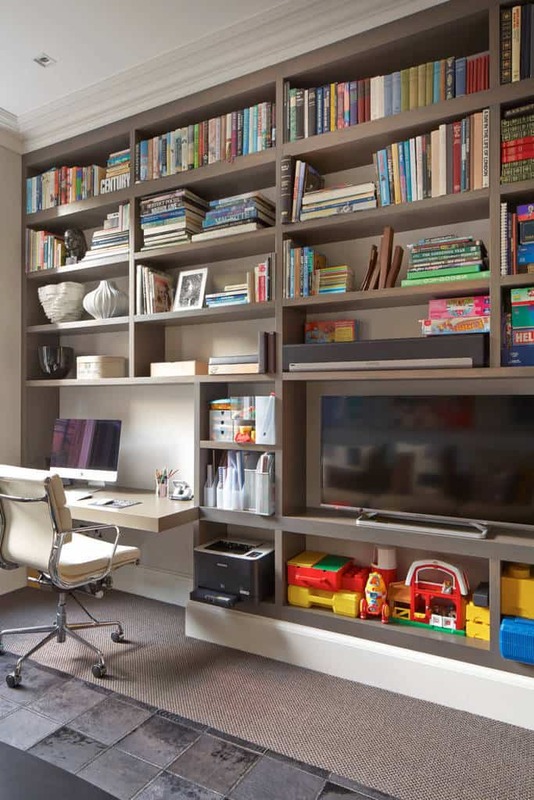 Make a home office with more than one work space if you have a busy family. This space is stylish with green color choices and has great functionality. 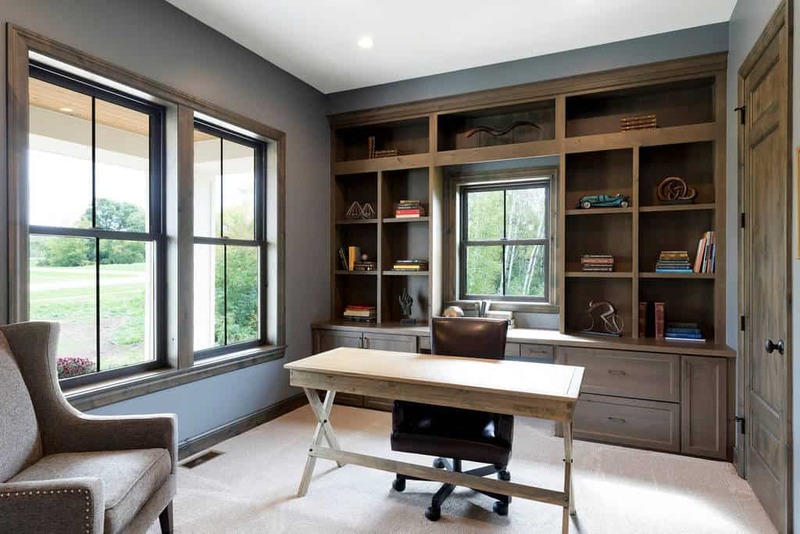 With the light hardwood blended with the dark hardwood shelves and drawers, this home office is very stylish. Photo by Town Line Wallpaper & Paint Inc. While the office itself it traditional, the decor makes this into a personalized space. If you are going to be taking meetings in your home office, be sure to create a space that your guests will be comfortable in. 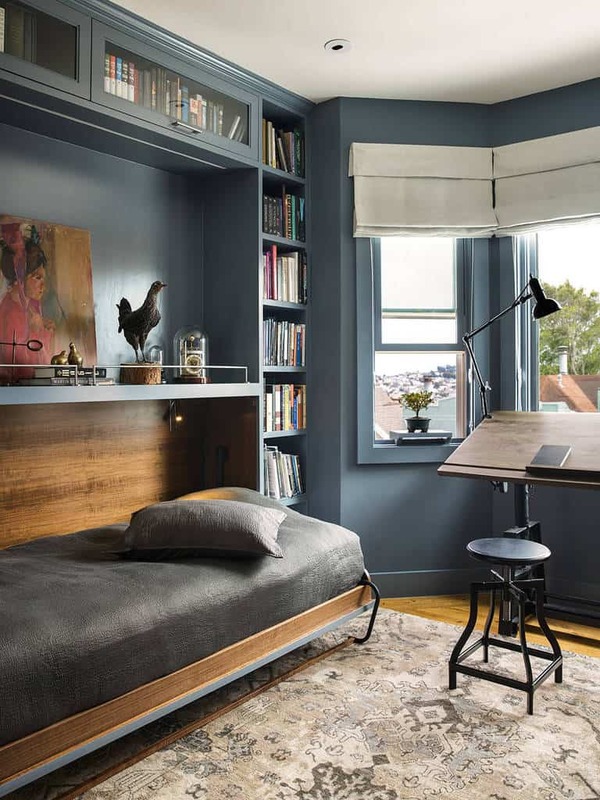 The furniture choices here blend so well with the calm blues and grays. This space takes in the natural light and shines. If you’re creative, make a home office that matches your personality. This space is full of great decor that brightens up the office. 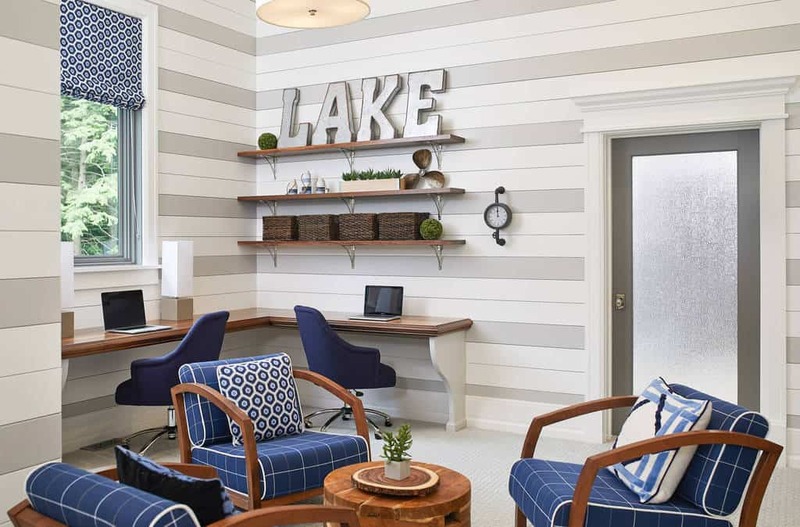 You can design your home office around a theme. This one uses a great ocean theme that really works well throughout the room. You can fit your home office anywhere you need to. Make sure to include things that match your personality, just like this one does. Using cork walls doesn’t have to be something that looks bad. These blend right in with the design of the room. 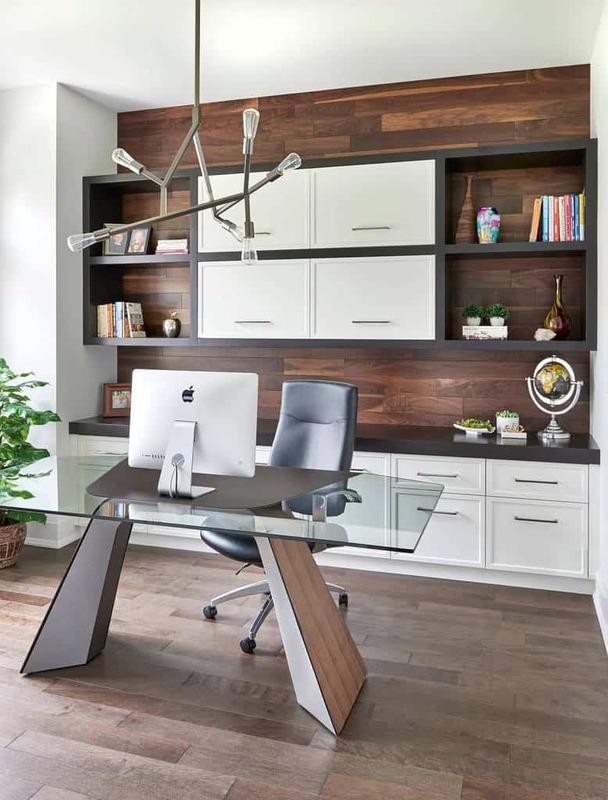 The bold and stylish hardwood of this home office creates a handsome environment that is the perfect work space. 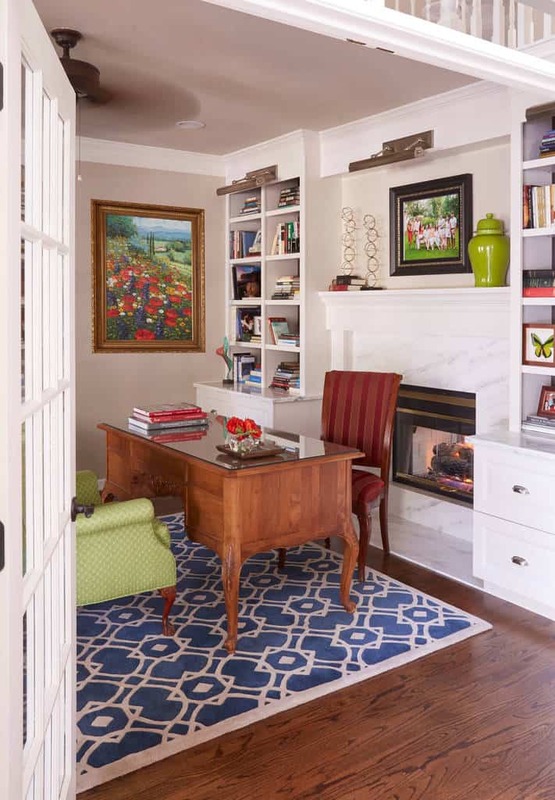 The blue colors and patterns used throughout this home officer really bring the room to life. There is plenty of room for more than one person to get work done. This home office is much more than just a space to work. It can function as a library as well as a place to relax and read. You don’t have to have a traditional space. 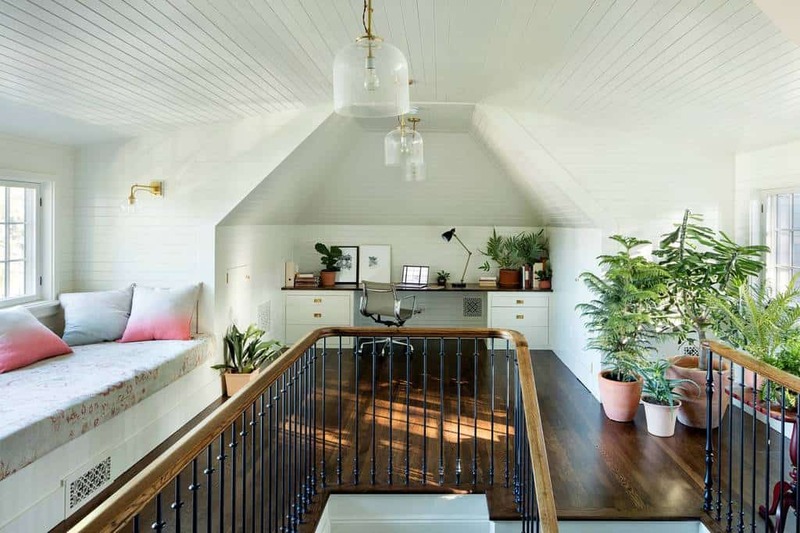 This home office has unique furniture and decor that makes it a fun space. This whole space is functional and looks great. The hardwood floors are matched by the counter top and there are plenty of shelves for storage. 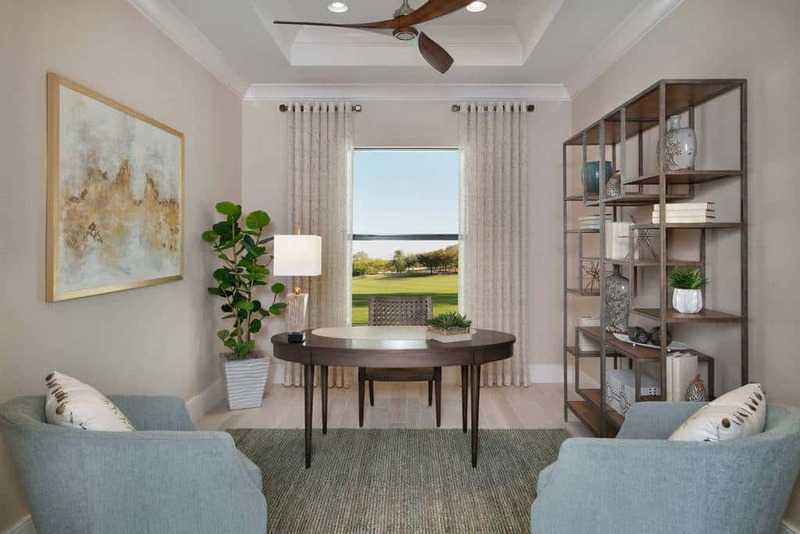 The open floor plan in this home office leaves plenty of space to move around. This office has plenty of space for multiple people to work at the same time. You can set up your home office to have multiple work spaces so everyone can get their work done for the day. Photo by Bella Custom Homes, Inc. 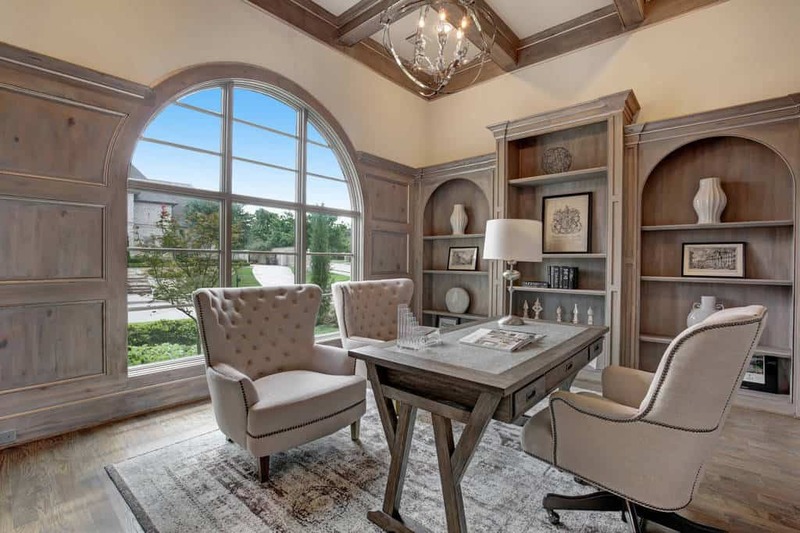 This home office has great style, starting with the large arched window. The light furniture brings great character to the room and looks great in the natural light. 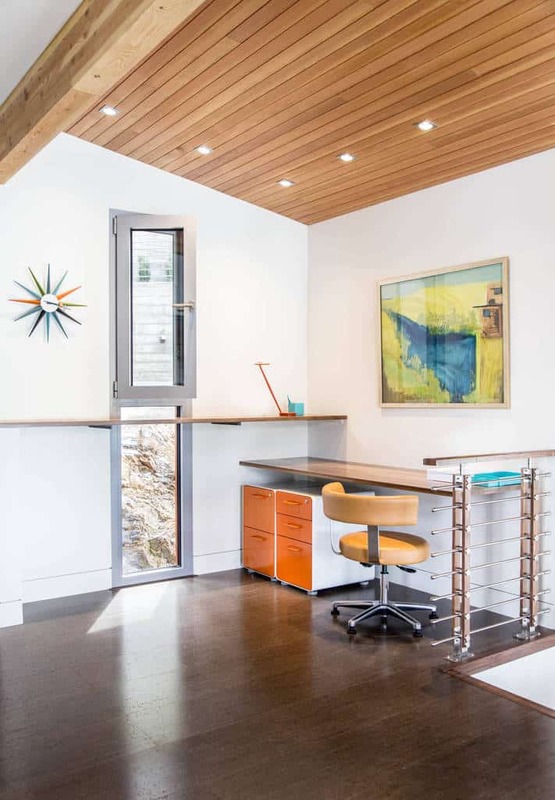 This home office makes use of great contemporary furniture and hardwood throughout. You have plenty of shelf space for decor and books. 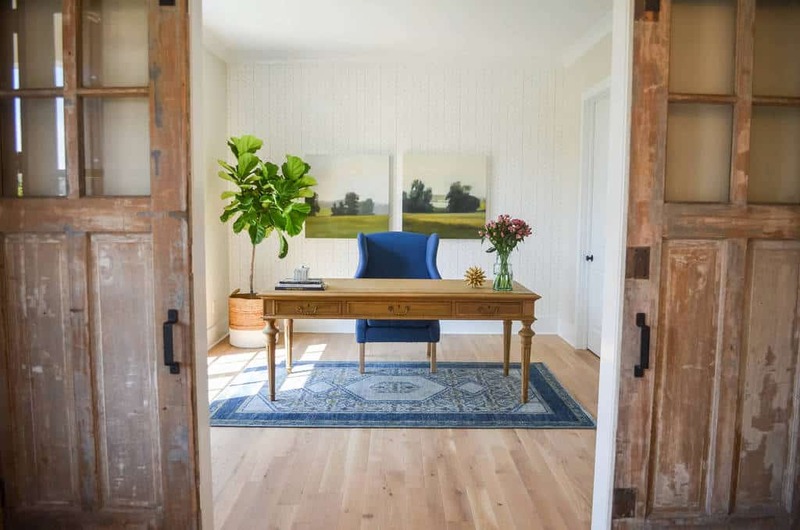 The hardwood floor and colorful decor used in this home office give it a modern country charm that will be great to work in. Photo by Blackfish Homes Ltd. The abstract art decor stands out against the white backdrop. This home office is well lit and comfortable to work in. The great designs used here bring this space a contemporary feeling. This home office is modern and elegant. 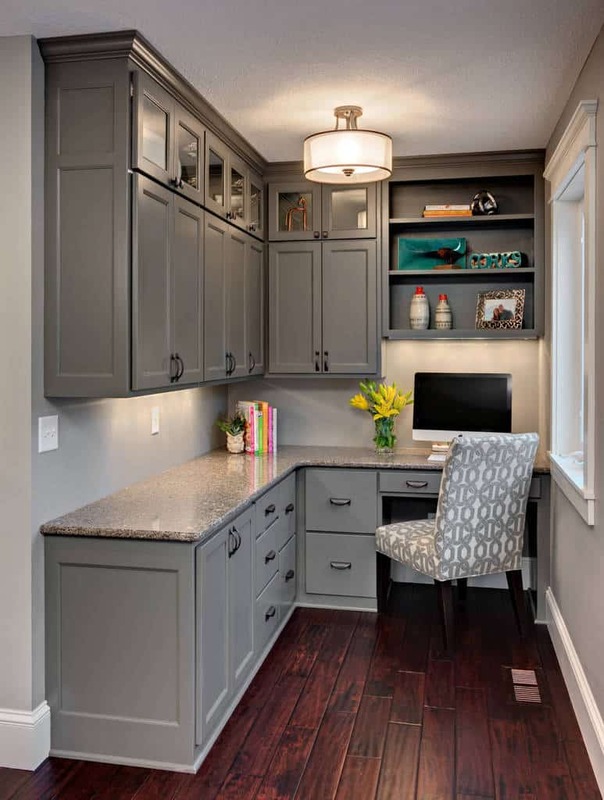 This comfortable home office has a great hardwood floor that blends well with the counter and shelving. 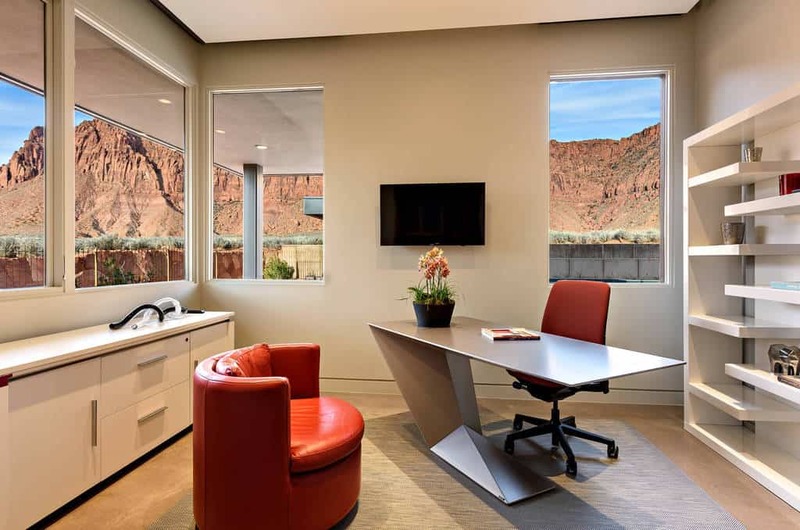 This desk is a great piece of modern furniture that goes well with this office. The shelving is creative and the whole space is well lit thanks to all of the windows. This simple hardwood desk is a perfect match for the hardwood floor. 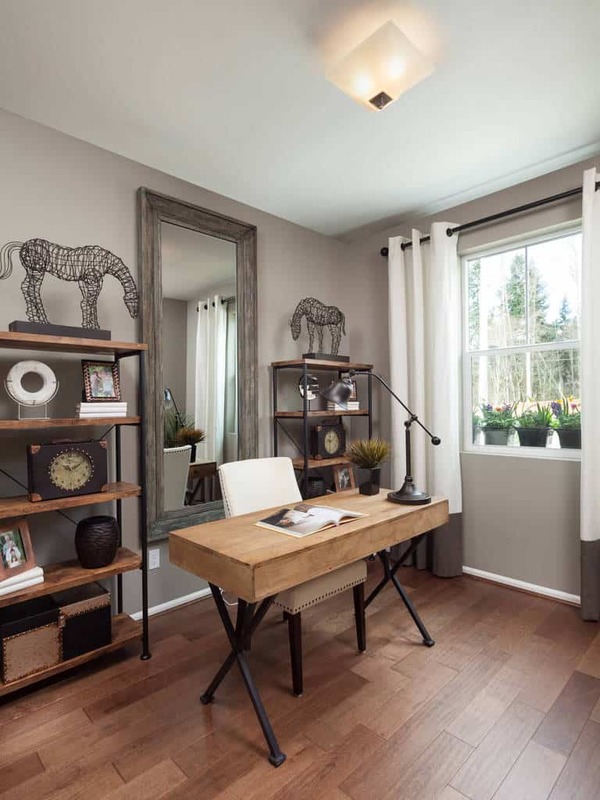 With great decor that blends well with the style of the room, this home office is ready for use. 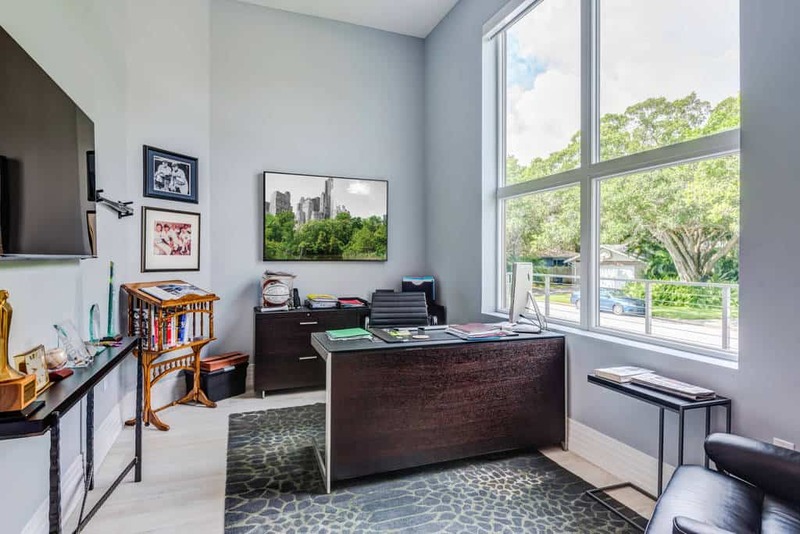 With great windows letting in plenty of natural light, this home office has a television so you won’t miss any important news during the day. This room uses bold hardwood styles that give it a great elegance. When you are finished working, you can relax on the comfortable bench. For those times when you’ve been working really hard and you just need a bit ro relax, lay down here for a quick nap. This room has everything you could need. Space for your computer, a table to work at, and plenty of shelves for storage. These square cabinet storage spaces look great and give you plenty of room for books and decor. Surrounded with a view of the outside, you can relax in this elegant space that uses a great desk style and lighting. 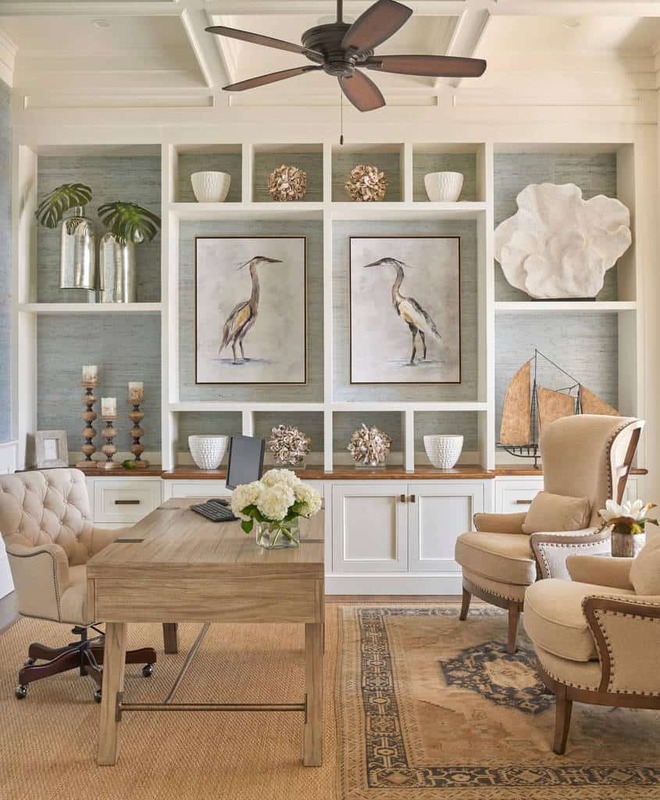 This home office uses hardwood and lighter colors to create a calming environment. Set up your space for more than one person to work. Using a weathered hardwood style works really well with lighter colors. When you have plenty of natural light shining in, you can show off your great decor. 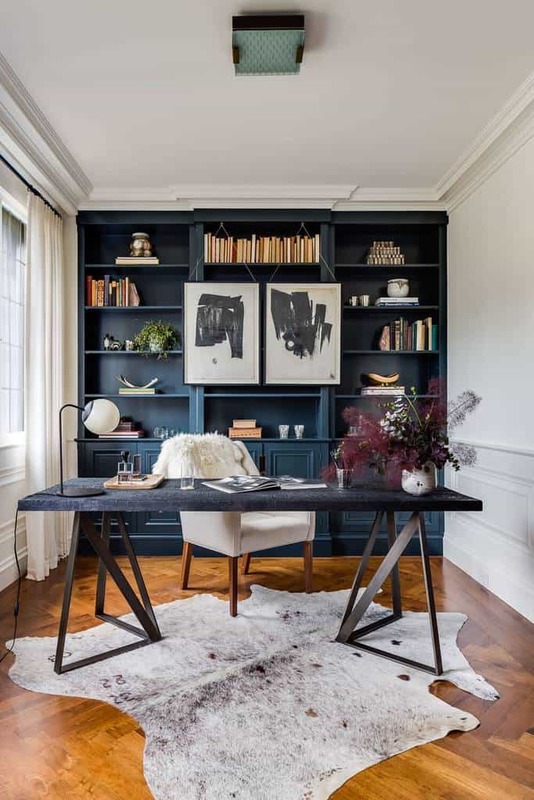 Photo by Alison Whittaker Design, Inc.
Darker hardwoods can bring your home office a bold character. Use simple decor to create a sophisticated space. When you have great windows like this, put them to use. 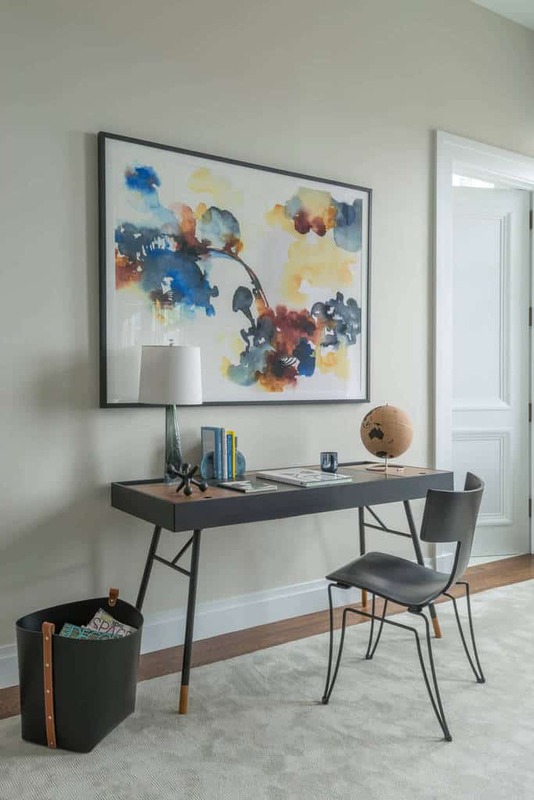 Placing a writing desk in this space is a great decision and makes use of all of your space. The shelving choices used here really make this space modern. This office is separated to create two work spaces. 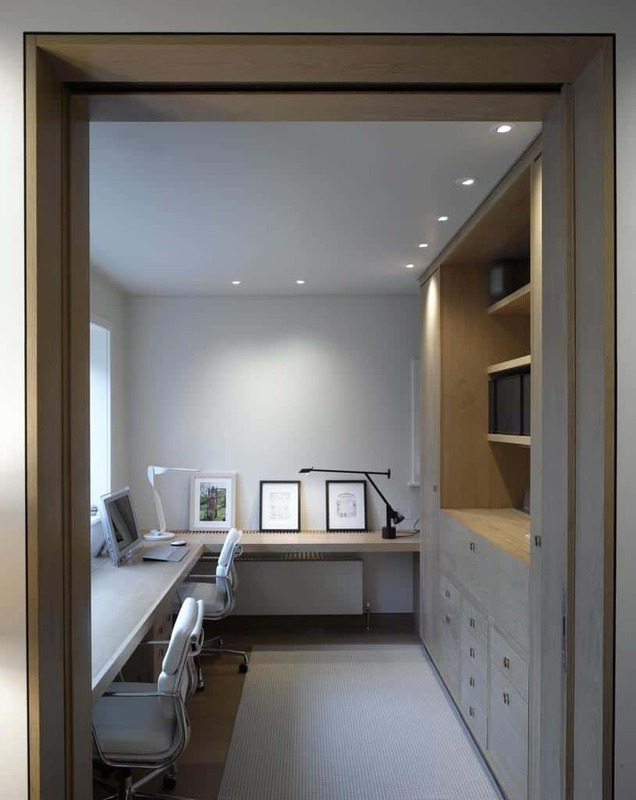 These sliding doors take on a weathered hardwood style and welcome you into an elegant home office. Photo by Moehl Millwork, Inc.
Make the space you want to work in everyday. 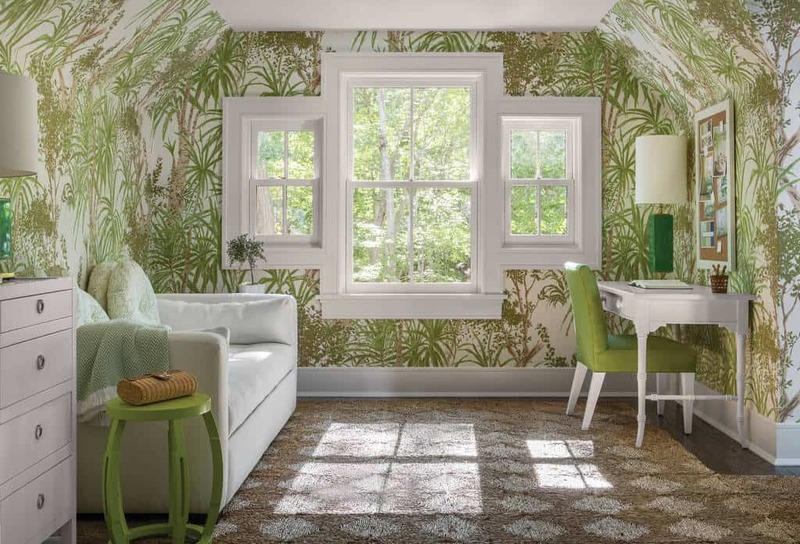 This home office take a tropical theme and runs with it. With great wallpaper and furniture to match, you will love being here everyday. 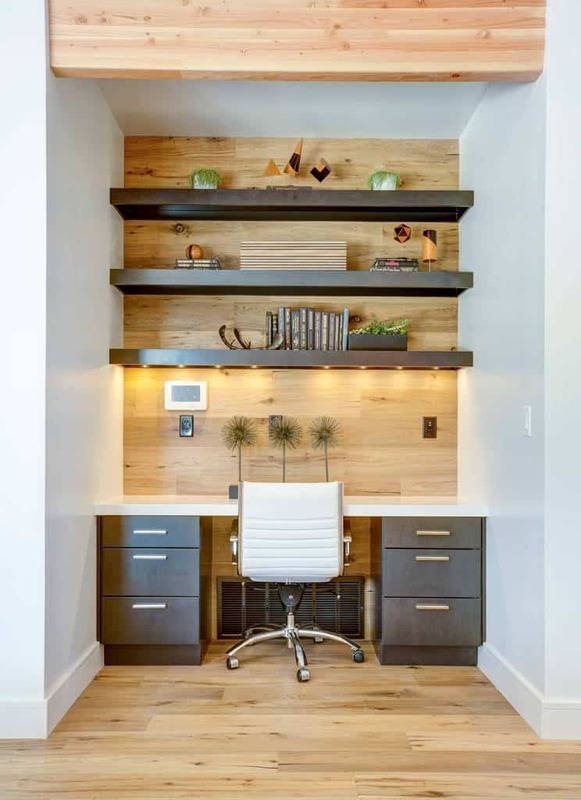 With calm but stylish color choices, this home office uses great decor, such as this re-purposed tree stump. Your home office is where you will spend a good bit of time, so make sure it has things that matter in our life. 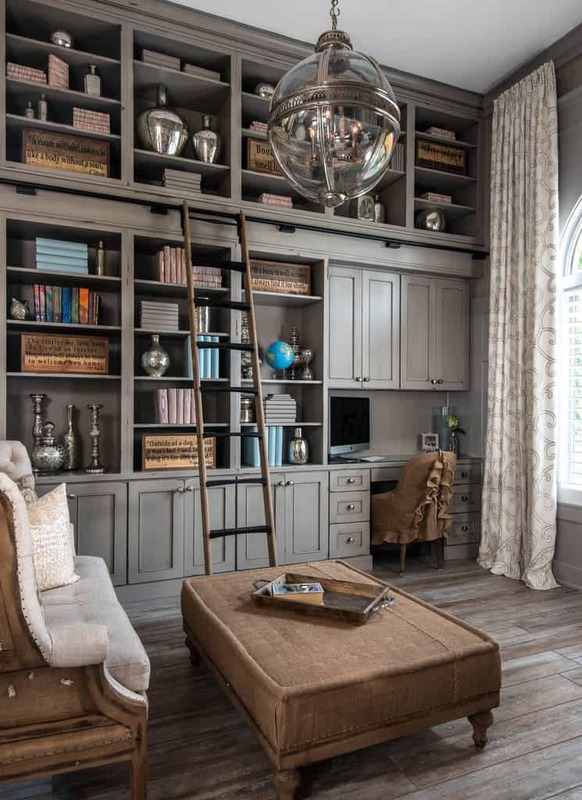 This one has books, a television, and plenty of space to get work done. The dark hardwood of these shelves works really well for the character of this office. This simple yet stylish desk stands out against the backdrop.